Thomas Tallis was a prominent English church organist and composer, whose nine psalm chant pieces were included in Archbishop Matthew Parker's Psalter of 1567. 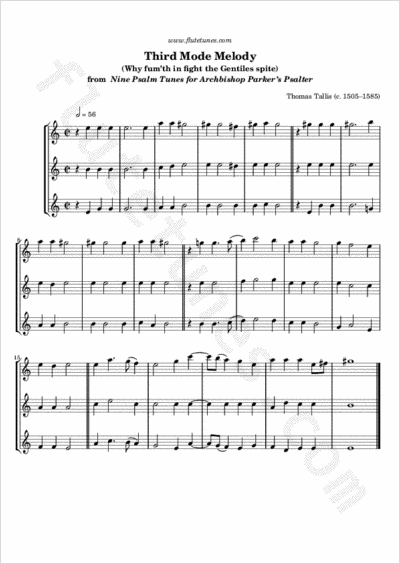 The “Third Mode Melody” is perhaps Tallis's best-known composition today, due to its appearance as background music in the 2003 film Master and Commander, which featured Ralph Vaughan Williams's 1910 Fantasia on a Theme by Thomas Tallis for string orchestra. For his work, Vaughan Williams took much inspiration from music of the English Renaissance; actually, many of his compositions are associated with or inspired by the music of this period. Gregorian chants, named after Pope Gregory I, are among the earliest church music used in celebration of mass and other liturgical sacraments of the Church. Within medieval Gregorian chant, there are seven “modes” that correspond to scales; Tallis's tune is based on the third mode, the so-called “Phrygian” mode. Its scale is similar to that of a piece in E minor, with the difference that the second note is F-natural, and not F-sharp. Therefore, even if F-sharps are present, they are to be considered as accidental notes. This arrangement can also be played as a duet by omitting the middle voice.